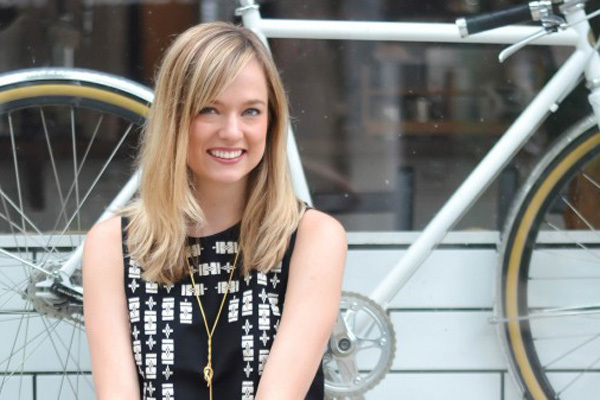 When it comes to choosing jewelry to wear on your wedding day there is only one rule… make sure it’s a reflection of you. Maybe it’s a piece that reminds you of where you and your fiancée met or got engaged. Maybe it’s a stone that represents your ancestry. Or maybe it just feels right. 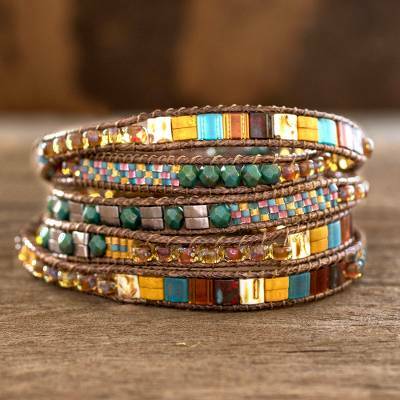 Whatever the reason, this is your day and NOVICA is here to help you shine. 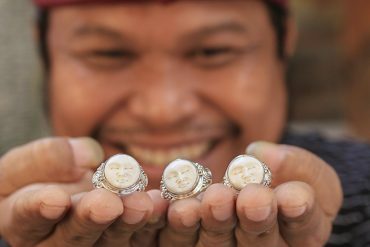 There’s nothing more timeless than a strand of pearls and NOVICA offers options from all corners of the world. From chokers to long strands, simple studs to dangling, these gems are a staple for brides. 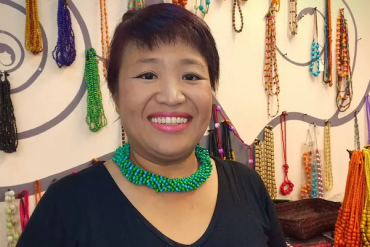 This cultured triple strand necklace, handcrafted by Matta Nandrakwang of Thailand, offers a soft and gentle look. Paired with matching earrings, it’s hard to go wrong. 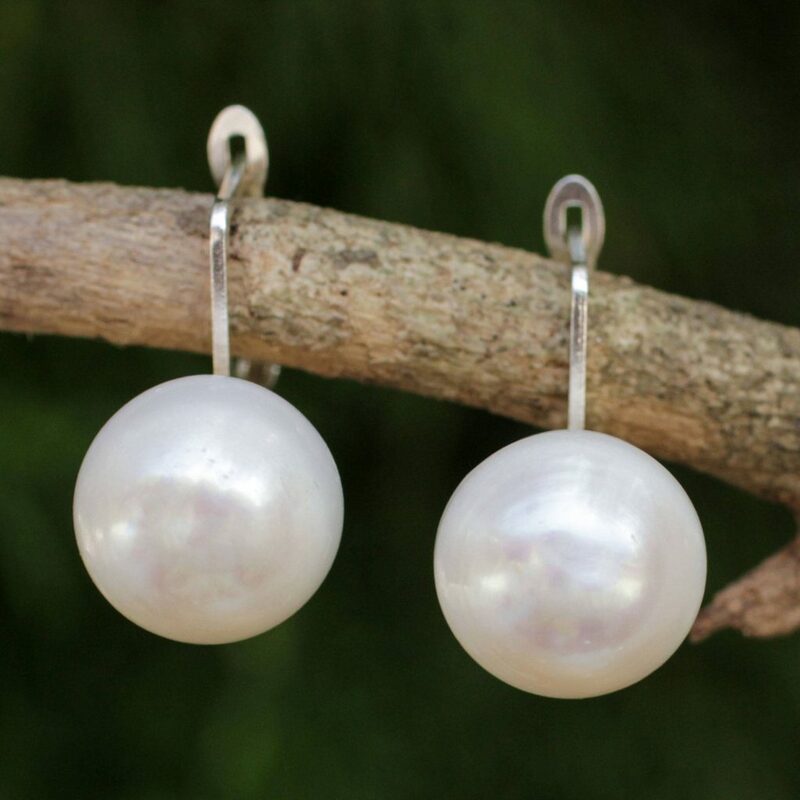 Matta’s fair trade freshwater pearl drop earrings, beautifully set with sterling silver, are poised to be purchased along with her necklace, but they are also bold enough to stand on their own. 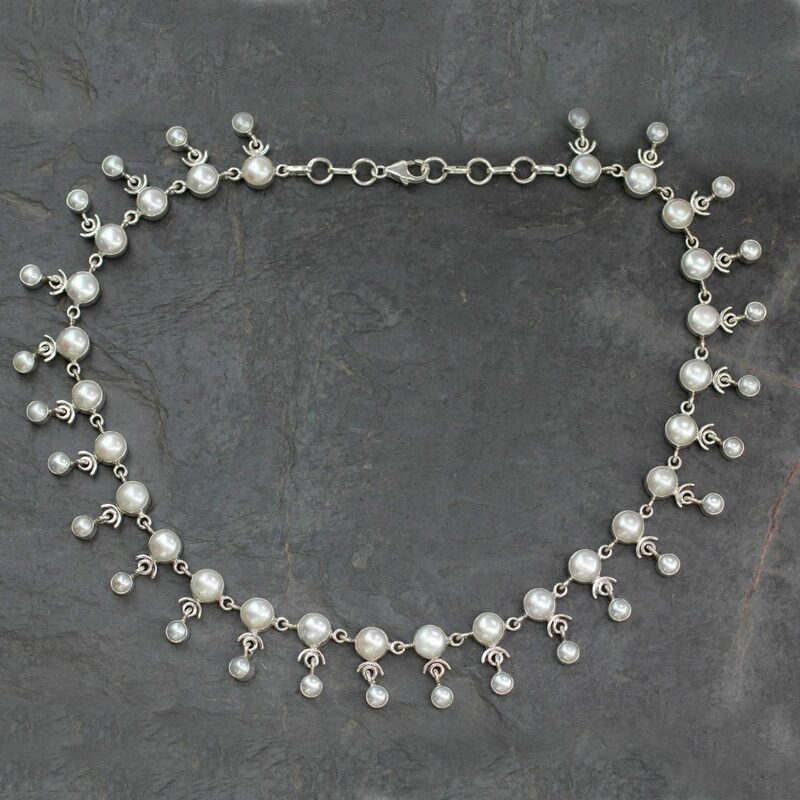 For the bride who wants to get a bit more playful with her pearls, look to India’s Bhavesh. 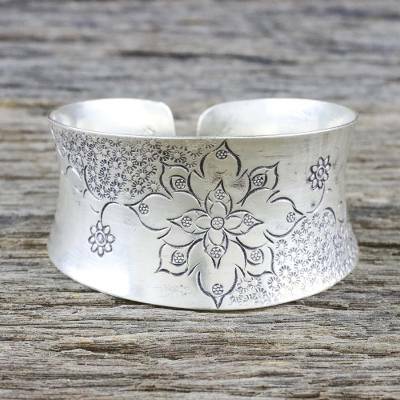 He created this dazzling “waterfall” choker with stunning swirls of silver to give it a polished, playful feel. A choker like this one is a great choice if your gown is strapless or has a low neckline. While pearls are timeless, there’s nothing like adding some color to all that white. 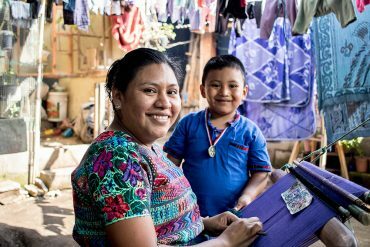 In fact, there’s an old saying that wearing “something old, something new, something borrowed and something blue” will bring you luck on your wedding day. This “peaceful blues” pendant is a great way to check that “blue” box. 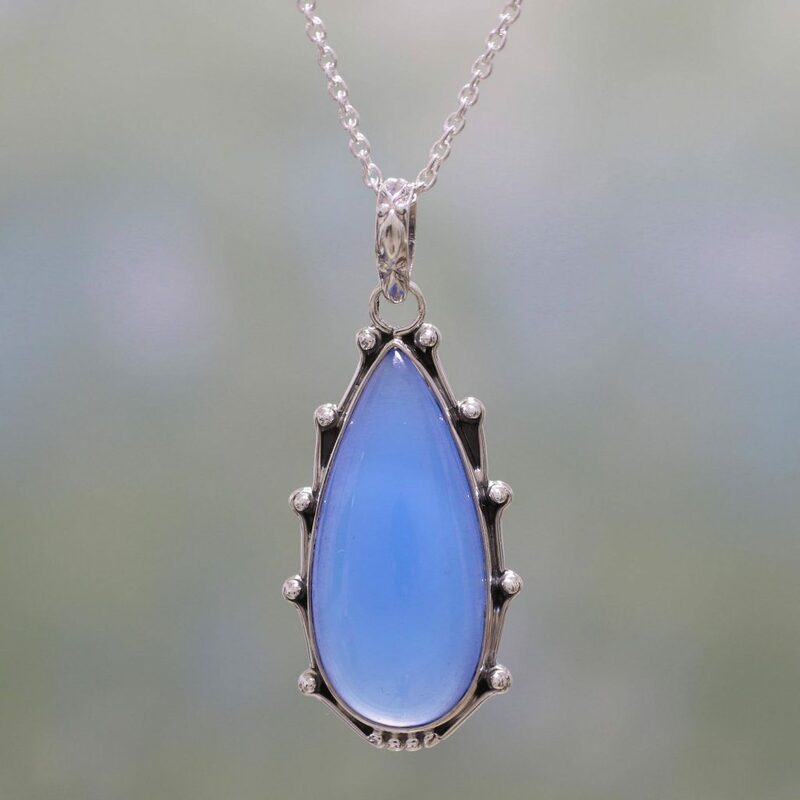 Made with blue chalcedony, it’s a unique piece that will give your bridal look that final touch with a little bit of edge. 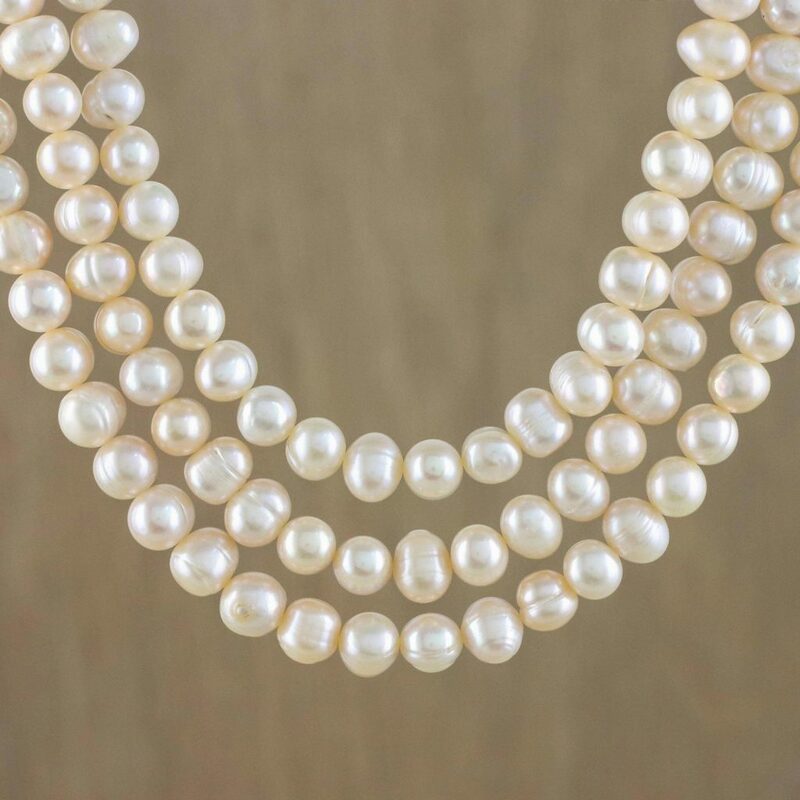 Of course, if you just can’t choose between classic pearls and eye-catching colors, you don’t have to. There are plenty of multi-gem pieces available like these “rainbow lily” earrings made in Thailand. 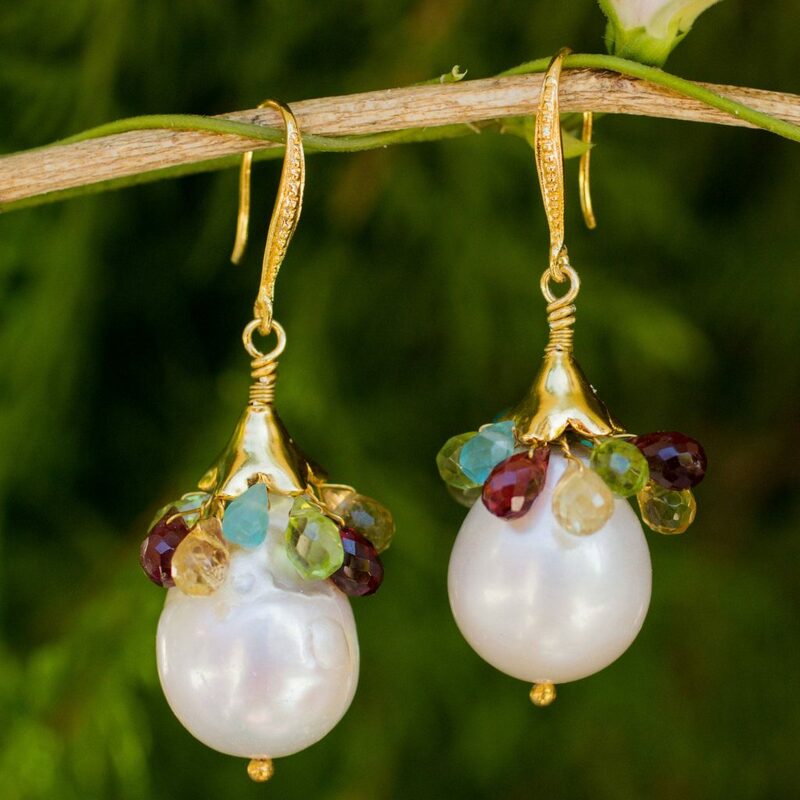 Constructed with 24k gold plated sterling silver and gemstones including freshwater cultured pearls, garnet, apatite, citrine and peridot, this piece tells the world that it’s your day and you can have it all. If your gown is ivory or champagne, gold jewelry is the ideal complement. 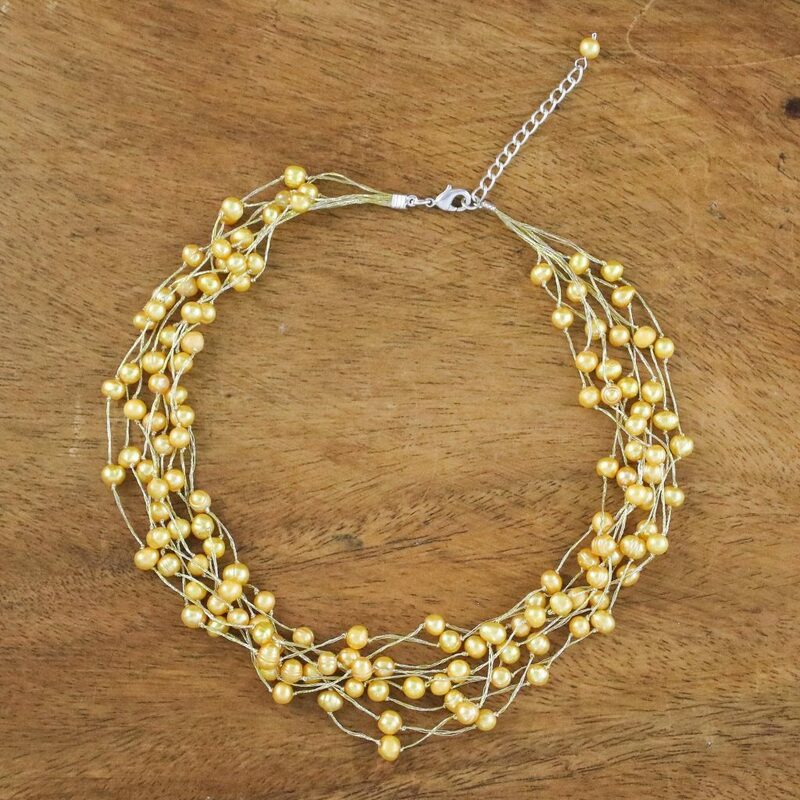 This “golden web of beauty” is handmade in Thailand. 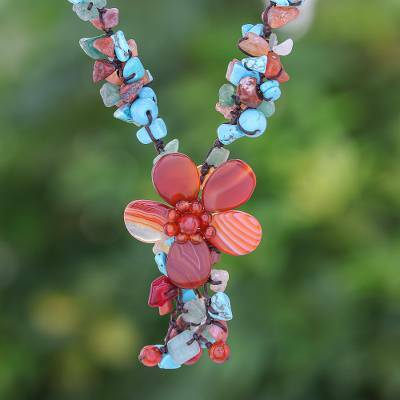 Designed using dyed cultured pearls and silk, this necklace adds a spectacular touch of class to any look. 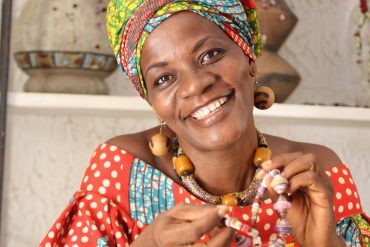 For a more traditional feeling, consider a simple gold necklace or bracelet. 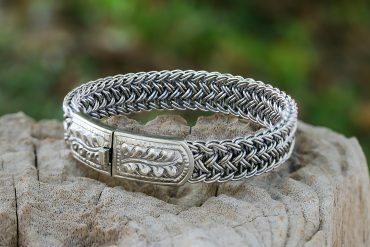 This West African cuff bracelet, created in South Africa, is timeless in its appeal. 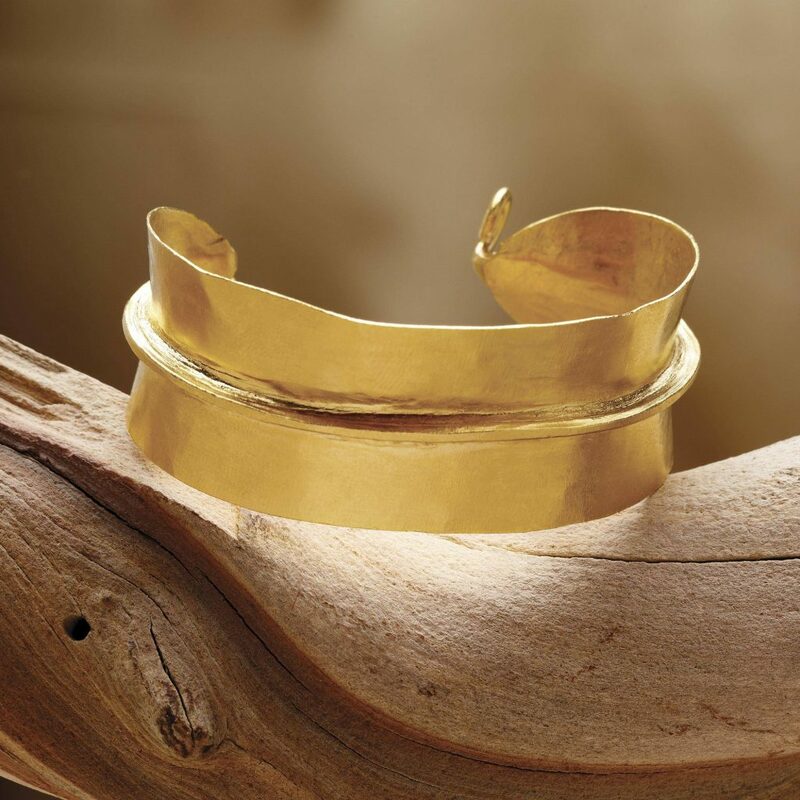 Based on a design that has been worn for centuries, this large yet lightweight bangle is handcrafted from 24k gold plated hand-hammered brass. 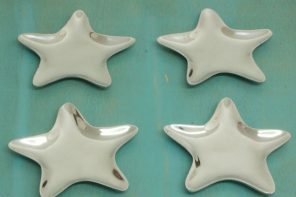 If you’re wearing bright white, consider accessorizing with platinum or sterling silver. 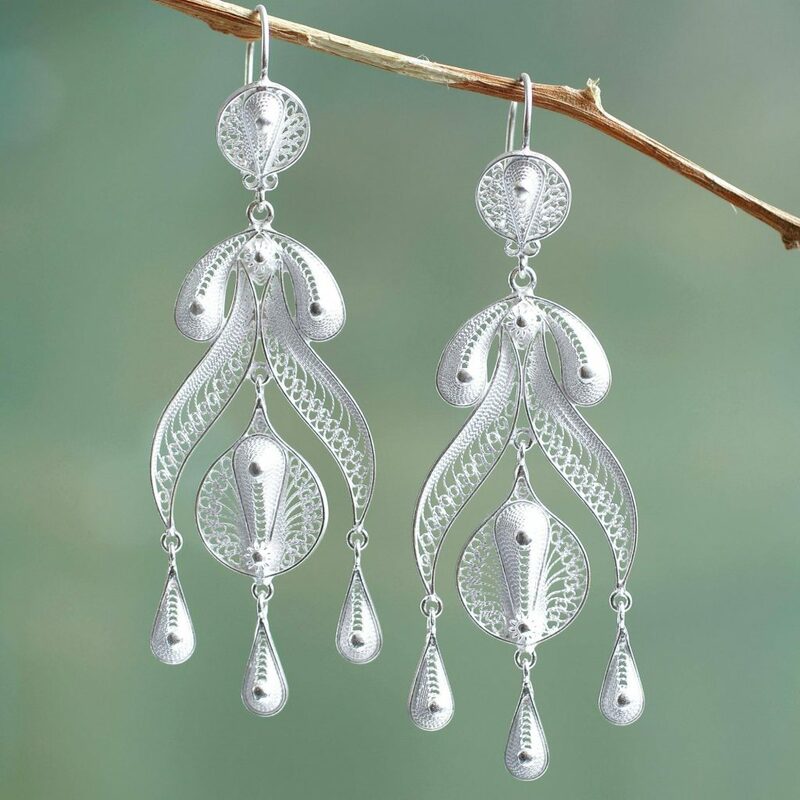 These chandelier, filigree earrings are made with silver mined in the Andes. 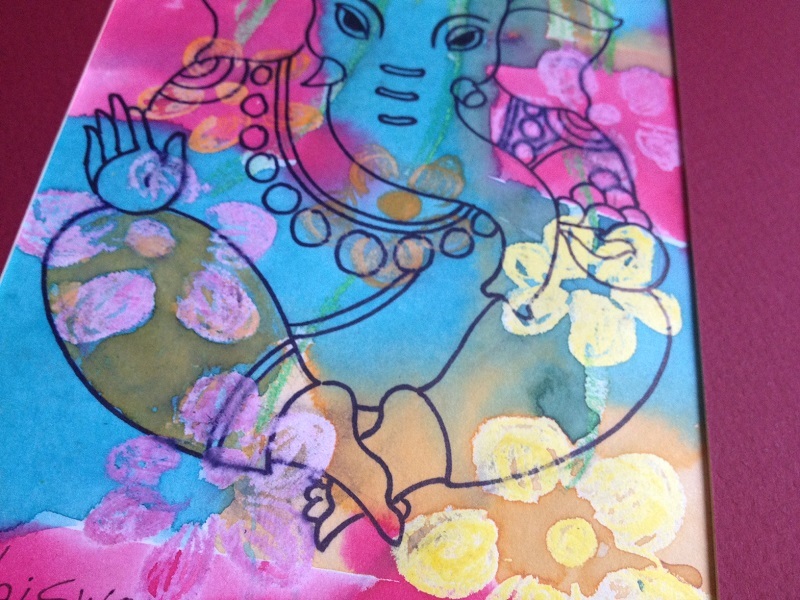 Their delicate and intricate design make them a flawless choice. 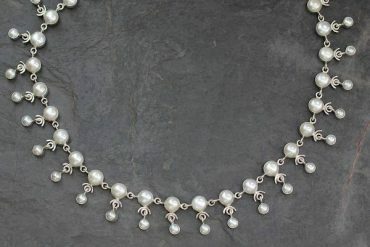 For a silver statement-making necklace, consider this “Ice” necklace made in India. 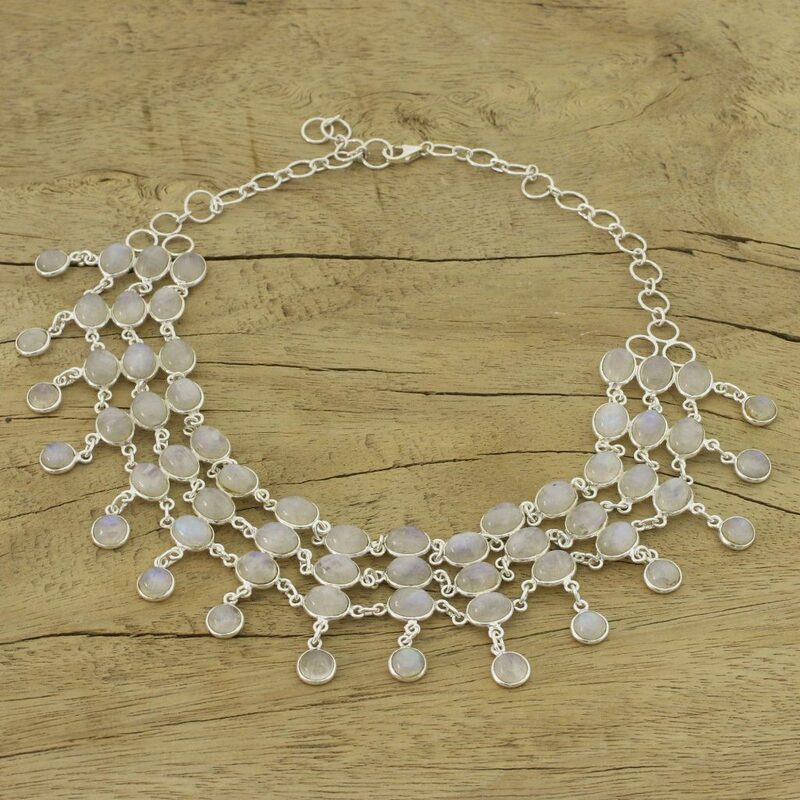 Luminous rainbow moonstones linked with fine sterling chains give this unique choker an extra touch of flair. 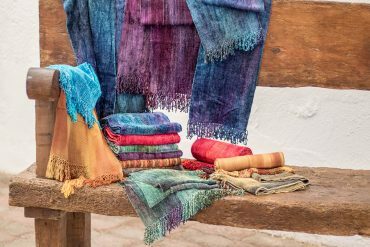 In the end, the perfect piece is the one you feel most comfortable wearing. 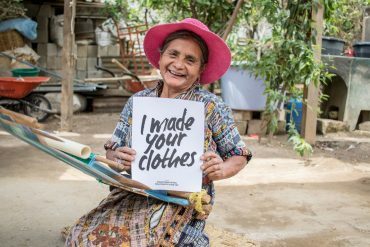 Confidence radiates from within and the smile you get from wearing something meaningful that you love is the greatest accessory of all.